As an historian who specialized in the Age of European Seaborne Exploration I find it difficult when I come upon discussions about a national holiday like this one. It is difficult because, of late, the history of Christopher Columbus (actually Cristoforo Colombo) has been associated in the minds of the non-historian public with agendas and pseudohistorical beliefs not related to the man or the facts of his life. To people who oppose the holiday associated with Columbus Day, they usually base their objections by laying on one man’s doorstep the depredations that were to come to the existing American cultures and nations when he arrived at Hispaniola. Such an interpretation and reading of history is not history–it is posturing. 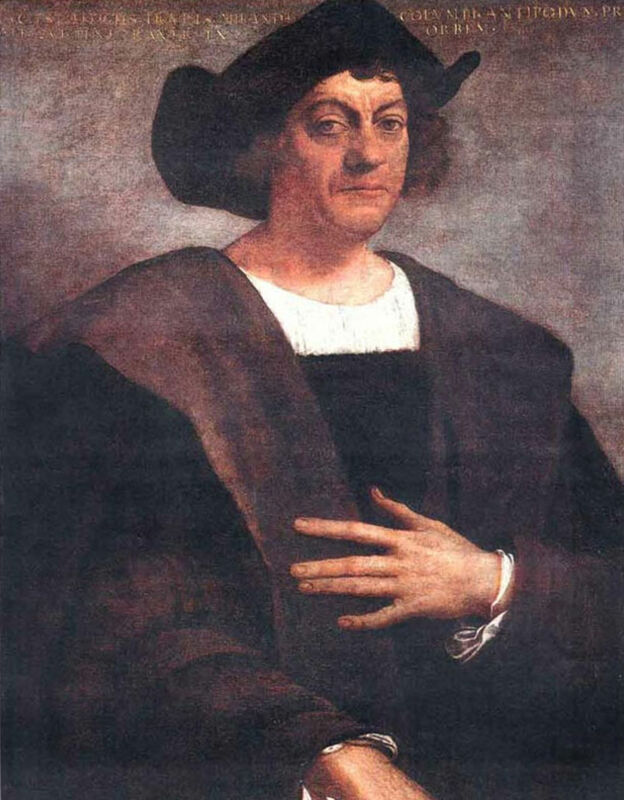 For a good argument on why the Christopher Columbus holiday is still relevant in understanding who we are as a people I recommend this article by William J. Connell in The American Scholar. The purpose of the holiday, which is different from the history of the man and his life, was intended to include not only new immigrants and the descendants of European settlers, but also first cultures and civilizations. From the roots of this cross-discovery of a world vastly different than the people at the time conceived, a new concept of democracy and inclusiveness has grown. I will elaborate on these differences below. But, needless to say, without the concept and imagination of a “New World”, I think it is very probable that the Enlightenment would not have happened. We will never know this, but the antecedent events contributing to it would not have unfolded as they did. As to the man, Cristoforo Colombo was born in the Republic of Genoa in 1451. Like many boys and young men of his generation who grew up near the Mediterranean Sea during this time in history, he heard many stories of far off lands and riches to be claimed. He apprenticed on small boats plying the Mediterranean and Aegean seas, and the North Atlantic as far as England and, it seems, Iceland. After a youth of travel and adventure he settled for a while in Portugal. During this time Portugal had long been the leader in seeking a sea route to the Spice Islands. The fall of Constantinople in 1453 by the Ottoman Empire had closed off the land routes to Asia and the spice trade. In the late 14th and 15th centuries Europe began to awaken from the 1,000 year old age of discontinuity and chaos that had been brought on by the fall of the Western Roman Empire. By the time 1453 rolled around, Europe had reorganized itself politically and socially, inspired by the reintroduction of the long lost Greek writings into centers of learning, that then sparked a new scientific and Humanist movement known as the Renaissance. But Christian Europe saw itself surrounded and under siege by a new enemy–Islam–which stretched from Spain (the remnants of Moorish Al-Andalus), across northern Africa, to Vienna, and then beyond to the borders of the Mogul empires of India and Asia. Many non-historians today wonder why connecting with the Spice Islands was so important to the Europeans. The reason was that spices had become essential to the preservation of food, the elimination of many household pests, and key ingredients in medicine. So precious were spices in Europe that families who could afford them would lock them in special boxes in their homes. Spices to Europe at the time was as important as oil is today to modern civilization. Under Henry the Navigator the Portuguese began seeking routes around the Horn of Africa to the Indian Ocean in order to by-pass the Ottoman blockade, setting up trading forts and towns along the coasts where they sought an understanding with the Muslim traders so necessary to commerce. But Portugal’s closest neighbor, Spain, had a different agenda. Born in the crucible of a long war in which its various kingdoms, sometimes in league and sometimes alone, sought independence from the Moors under the banner of Catholicism, Spain’s motivations were revolutionary, strongly motivated by Millenarianism. In 1479 Isabella of Castile and Ferdinand of Aragon, known as the Catholic Monarchs, established themselves as the vanguard not only for a united Spain, but in the vanguard of expanding European Catholic influence around the world. They thus became a competitor to Portugal in the search for a path to the trading posts of Asia. As an aside, the year 1492 is significant in this history in both tragic and victorious terms depending on one’s point of view: it was the year Columbus landed in the New World (though he didn’t know it at the time, but more on this later), Granada–the last Moorish outpost on the peninsula–fell to Spain, and it was the year of the ordering of the expulsion of the Jews from Spain. The rule under the Catholic Monarchs objectively, even for the time, can only be described as constituting a reign of terror. The closest modern equivalents that compare are probably Nazi Germany, the Soviet Union during the forced collectivization of the farms, and the Cultural Revolution under Mao in China. Warfare at the time was very personal and close, involving swords, piercing weapons, crushing weapons, and crude explosives. Enforcement of religious and civil authority was barbaric and these measures, with some variation, existed in just about every major civilization in the world at the time, but the Catholic Monarchs employed these measures with great liberality. Because Spain saw itself as needing to purify itself from both internal and external enemies, everyone was under suspicion of betrayal to the One True God. Under the Catholic Orders under the Inquisition children denounced their parents, neighbor condemned neighbor, brother and sister betrayed brother and sister for not being truly devout. In a world lit only by fire, superstitious beliefs ran rampant. Belief in witches, demons, and evil spirits infected every facet of daily life. Punishment for crimes against both society and religion were dealt with cruelly and savagely by modern standards: dunking, the Iron Maiden, flaying, piercing, dislocation of limbs, racking, being drawn and quartered, and other methods were commonplace. The only limits to such officially sanctioned methods was the imagination of the civil authority. It was under this backdrop that Columbus approached the Catholic Monarchs with his idea of sailing to the west across the globe in order to reach Asia. Contrary to the 19th century legend, explorers, navigators, and educated people of the time did not reject his idea because they believed the world was flat and his ships would fall off. Instead, in order to gain support for his voyage he pitched an idea that the circumference of the earth was much less–about 6,000 to 10,000 miles less–than the 25,000 miles calculated (almost correctly, around the equator the distance is 24,902 miles) by the ancient Greeks. At first Spain rejected his request. He then pitched the idea to Portugal and England unsuccessfully. Finally, seeing that Portugal was about ready to access the Indian Ocean after successfully navigating the Horn, Spain called Columbus back and agreed to fund his expedition. It is thus one of those great comedies of the human condition that a man who was wrong about just about everything managed to engineer such a history altering achievement. Even after landing in the New World Columbus did not know that he had not reached “the Indies” as the Asian outer islands became known. The term “Indian” to describe the first American cultures and civilizations encountered, was based on this misunderstanding. So convinced was he that he had simply skirted the outer islands of Japan that he returned on subsequent voyages to prove his achievement. He died thinking that he had proven a western route to Asia. There is much that is troubling in his behavior when he came across the civilizations he encountered. By modern standards these actions are seen as barbaric, though many of them are used to conflate subsequent actions by others. Furthermore, entire portions get their history wrong, like this article that typify the genre. Once again, it is necessary to bring some fact and historical context into the times. Slavery was a common practice, particularly since the Portuguese began to engage in trade after their contact with the Azores and Africa. The depredations visited on the average person once considered to be part of a conquered people were completely arbitrary. Women and girls were raped, men when not killed, were used as beasts of burden. It must be mentioned here, however, that later it was also the Catholic countries in Europe that first acted against the slave trade, though only particular aspects of it. Pope Paul III first forbade the practice of enslaving the first people found in new lands in 1537. Spain, under tremendous pressure from Rome, and thanks largely to the efforts of Bartolome De Las Casas and others, passed laws forbidding the enslavement of the “Indians.” Unfortunately, these laws allowed for labor to be supplemented by the African Slave Trade. One must keep in mind that sea voyages in the 15th century were extremely dangerous. Crews were often impressed into service, oftentimes taken from prisons in order to rid the country of its criminal population. Conditions on ship were unsanitary and dangerous. Being well before the age of the disease theory of illness or any understanding of bacterial or viral infections, attrition at sea was staggering. Some ships lost 95% of their crews on voyages. Many voyages ended in shipwreck or mutiny. The Nina, Pinta, and Santa Maria were not built for the open sea. They were trading vessels meant for the confines of the Mediterranean. Their lengths are estimated to have been from 50 to 58 feet. After a few days onboard ship both food and water went bad. Both human- and ship-born vermin was the norm. Thus, Columbus had to possess outstanding qualities of leadership and discipline in order to make such a voyage, and contemporaneous accounts attest to these traits. Furthermore, using his knowledge of trade currents and winds, Columbus managed to cross the ocean without the benefit of charts or knowing what lay ahead. That he did this in three small ships or large boats makes his voyage significant both for its singular achievement, but also because he extended human knowledge of the earth and human existence on it. Much has been made about the tragedy of the first American civilizations in succumbing to what are believed to have been diseases introduced by Columbus or his men. While tragic in very real terms, one cannot objectively attribute this to intentional human agency on the part of Columbus. Nor were Columbus and his men the only Europeans in contact with those cultures after the results of the voyage were known. Even in what was thought to be more recent and traceable actions, there is even a great deal of reasonable doubt regarding the more modern charge that the U.S. Calvary distributed smallpox tainted blankets in North Dakota in 1837. What we do know is that when isolated civilizations come in contact with each other disease oftentimes follows, perhaps because of differences in exposure to a greater and wider number of pathogens. Even in more modern times, the catastrophe of the First World War was followed by the flu epidemic of 1918-19. So virulent was the outbreak that it probably contributed to the defeat of Germany in the war more so than the entry of U.S. troops. So in introducing previously isolated civilizations and peoples to each other, and contributing to human geographical knowledge, Columbus is rightly honored for his achievements. Furthermore, history has also documented his actions which, by modern standards, are seen as cruel and questionable at best. That he did so as a matter of fact speaks more to the barbaric norms of his times than they do to any special failing on his part. But history, like any area of learning in seeking truth, is always open to revision and reinterpretation. But in discussing Columbus this revision and reinterpretation oftentimes is based on factors other than those allowed by the discipline of history, falling into the category of ideology, pseudohistory, or what I am calling cargo cult history. Science is a field in which uncertainty is a given. The same is the case with history. We can prove certain things as near as they can be proven to be true. But those wishing to deal in absolutes need to restrict themselves to logic or mathematics. The basis for advancing human knowledge is not limited to the schoolbook version of the scientific method, where a hypothesis, test, and control is used to determine validity or falsity of the hypothesis. Life is not that simple, nor is science that tidy. In the words of Michael Shermer, science is a collection of methods aimed at building “a testable body of knowledge open to rejection or confirmation.” But our knowledge through this method is always contingent, given new evidence. Of course, there comes a time when the preponderance of the facts and data is so overwhelming that it is highly improbable that the conclusion will be overturned. When new observations or tests are made, the fact that they confirm the strong hypothesis adds additional credibility, leading us closer to what we can call a fact. But what can be proven must also be able to be proven false. There has to be a test that determines falsity, since you cannot prove true what you cannot prove false. In history we are dealing, sometimes, with events that occurred some time ago. Oftentimes physical evidence has been lost, altered by time, or is inconclusive. We also deal with human weakness and frailty. People are often dishonest, even with themselves, or their perspectives are colored by unintended filters or by being overwhelmed by the events being experienced. Witnesses to the same event oftentimes record different details. This is a common phenomena documented by several controlled studies which has become known as the Rashomon effect. In the end we must avoid fooling ourselves through preferred explanations, ideology, or emotion. If we begin with a belief and then collect evidence to prove that belief, excluding all contradictory information, then we are not practicing either science or history. We are practicing propaganda or self-deception, or some variation in between. This is what I mean by the term pseudohistory. Along these same lines, but slightly different, in referring to cargo cult history, I am borrowing from the late physicist Richard Feynman in which he uses the term “cargo cult science.” We are engaged in cargo cult history if we rely solely or overwhelmingly on secondary sources for our knowledge, without either independently verifying those sources, nor augmenting them with primary sources or original research. For example, in the probable apocryphal story of smallpox blankets of 1837, all too many scholars and historians have repeated the charge without verifying the veracity of the original story. There is, however, direct evidence of smallpox being used as a weapon (or, at least, an attempt to do so) against a tribe during the French and Indian War. In the last two cases it is possible that the earlier story, whether the attempt was successful or not, became a legend regarding measures used against the North American tribes, leading to conclusions that any outbreak of smallpox was attributed to human intent. Thus, both pseudohistory and cargo cult history oftentimes are self-reinforcing. In the end we honor Columbus with a holiday not for everything he did–both Washington and Jefferson were slaveholders after all–but for the opening of the concept of a New World which eventually allowed for the development of the idea of a government based on the consent of the governed, of the rule of law, against arbitrary and cruel punishment, and inclusive of all people regardless of ethnicity, religious or non-religious observance, gender, and national origins. We still have a way to go in achieving many of our stated ideals–and in righting past wrongs, especially as it relates to the first civilizations and cultures, who were early immigrants themselves–but that’s why this holiday, for me at least, is still relevant. It highlights the truth, stupidity, and tragedy of human history–both its negative and positive aspects–as it relates to the Americas, without the need to sink into cultural posturing or pseudohistory. Note: The final version of this post has been modified to correct for one big chronological error (such is the consequence of blogging on the fly sometimes), and for clarity.